If your kids are in first grade, they are already acquainted with the different parts of speech. Kids in first grade are aware that a noun is a person, a thing or a place. 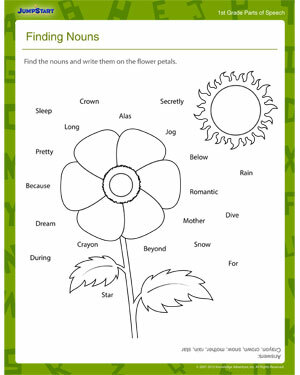 Help them add to their understanding and knowledge of nouns by introducing them to ‘Finding Nouns’ – a fun grammar worksheet for kids. This fun and engaging first grade worksheet helps kids to learn how to separate nouns from other parts of speech. Teachers and parents will find this noun worksheet extremely beneficial in helping kids improve their understanding of grammar as well as enhance their reading skills. Also check out our other 1st grade English worksheets.